Beer Cheese Soup Recipe from Scratch | Simple. Tasty. Good. Time for a beer cheese soup today! I never tasted this soup before until I went to New York about a year ago. Didn’t know quite what to expect but I wanted to try it anyway. First one I ordered back then was a bit edgy because I wasn’t sure about the texture. Fortunately the second beer cheese soup was much better! 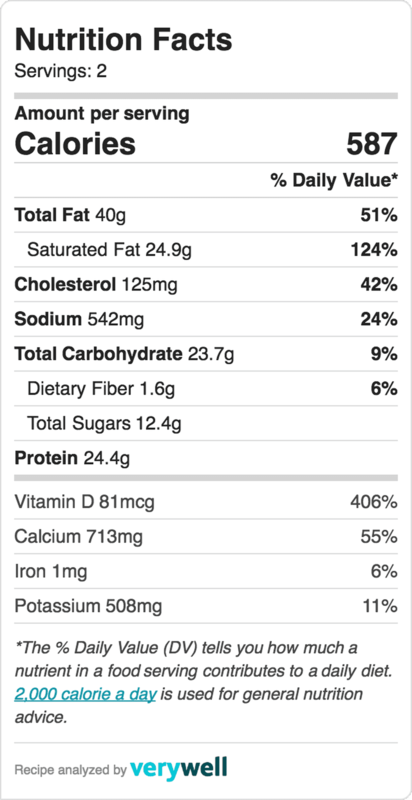 Seems like there are quite a few different recipes out there. Once home again I put it to the test and prepared a beer cheese soup myself this time. Watch how I’m preparing a decadent beer cheese soup with cheddar cheese in my fabulous KitchenAid Cook Processor! For the full step by step recipe: scroll down to the second recipe here on this page! You probably know how that goes: crawl through a bunch of different recipes online. Then add this, leave out that. 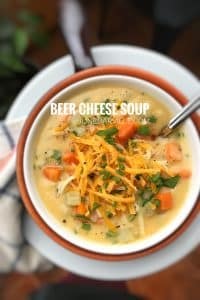 Let’s say the cheesy beer soup below is not the first I made but it’s definitely the best! Perfect gooey cheesy look and greatest velvety texture ever. Add the unsalted butter to a large saucepan and place it over medium heat. Once the butter has melted, add the chopped garlic, the diced carrot, onion and celery. Season with a good dash of pepper and salt. Stir fry the vegetables in the melted butter for about 5 minutes over medium heat. Sprinkle with the plain flour. Stir well. Let the flour bake a few minutes to get rid of its floury taste. Gradually add the warm milk to the saucepan. Keep stirring well. The mixture will start to thicken slowly. When all the milk is incorporated, gradually add the pale ale to the soup. Stir well. Add the strong mustard right in the end. Then add the grated cheddar cheese, stir very well and let it gently melt into the soup. Turn the heat low and put a lid on the pan for 5 minutes. Stir regularly. Then check the seasoning of the beer cheese soup and add extra pepper, salt or mustard to taste if necessary. Divide the beer cheese soup over large bowls, sprinkle with the freshly chopped parsley and serve piping hot. Here’s how to prepare this decadent beer cheese soup with cheddar cheese in the fabulous KitchenAid Cook Processor! I used program BOIL P3 for this soup. No need to adapt cooking times or temperatures. This program is just perfect to make a beer cheese soup! Have you seen the new lid on my KitchenAid Cook Processor? What I love about this new lid is the detachable center. It’s perfect to pour in liquids while the motor is running. And that’s just what we need to make this beer cheese soup! Once the vegetables and flour are mixed, no need to open the lid. Just pour in the milk and beer while the vegetables are being stirred! That’s just perfect to make this beer cheese soup thicken nicely. 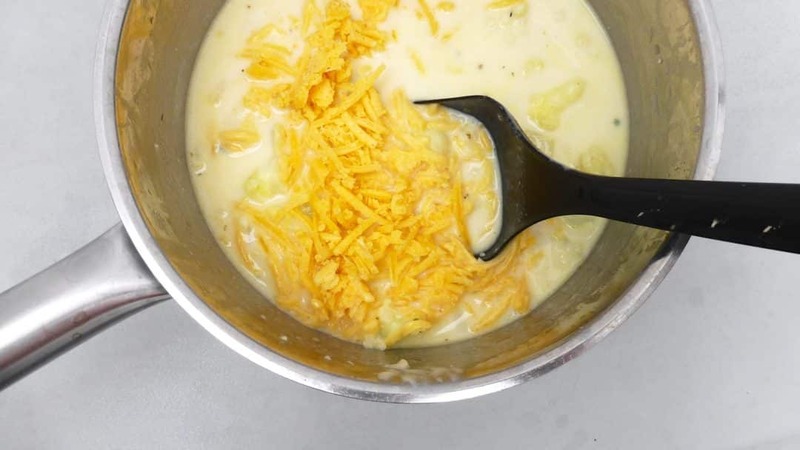 Enjoy this beer cheese soup recipe! 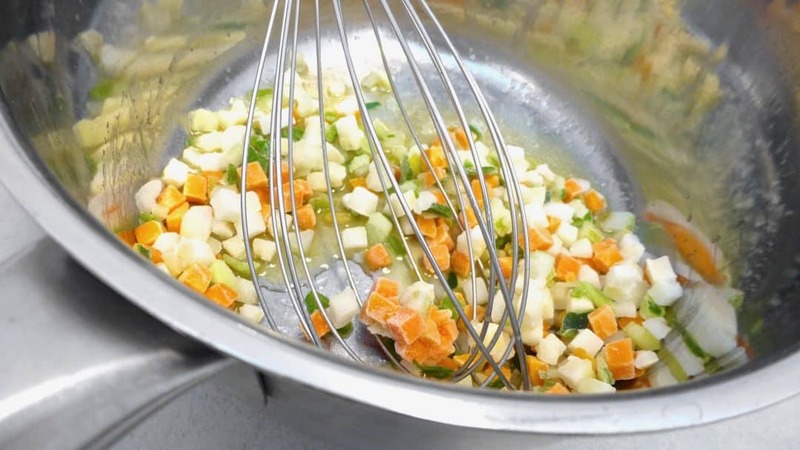 Add the butter, chopped garlic, diced carrot, onion and celery to the bowl of the Cook Processor fitted with the StirAssist. Season with pepper and salt. Close the bowl of the Cook Processor and select BOIL P3. Press Start to activate the program. 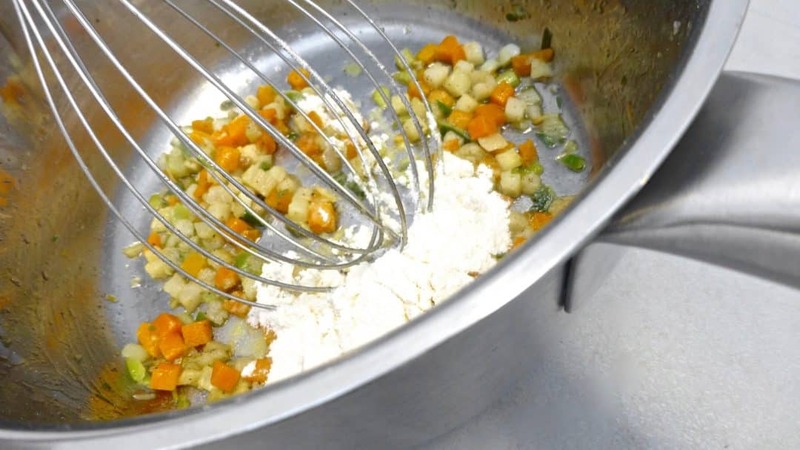 After Step 1, sprinkle the vegetables with the plain flour. Close the bowl and press Start to activate Step 2. Let the flour bake for about 2 minutes to get rid of its floury taste. Then remove the center of the lid and slowly pour the warm whole milk into the bowl. 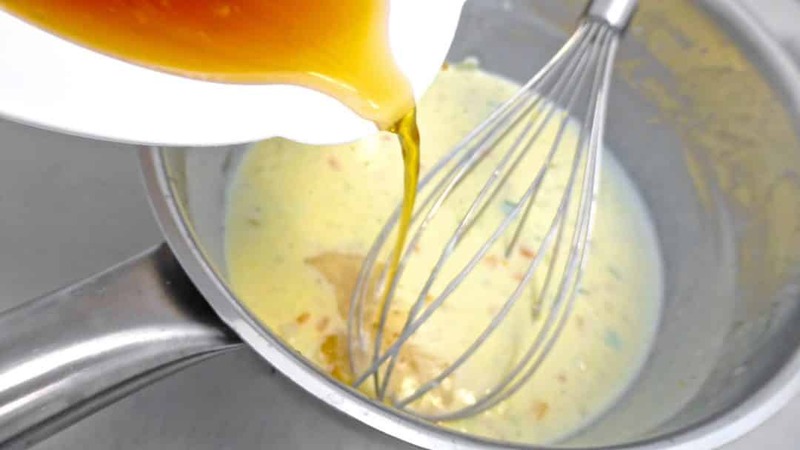 The mixture will start to thicken slowly. When all the milk is incorporated, gradually pour in the pale ale to the soup. Close the center of the lid again and let the beer soup cook further. After Step 2 add the strong mustard and the grated cheddar cheese to the bowl. Close the bowl again and press Start to activate Step 3. Once the program is finished, press cancel to exit the keep warm mode. Check the seasoning of the beer cheese soup and add extra pepper, salt or mustard to taste if necessary. Divide the beer cheese soup over large bowls, sprinkle with the freshly chopped parsley and serve piping hot. Do you also love the combination of beer and cheese? Looking for more beer and cheese recipes? Then also check these amazing recipes! I love to make cheese soups and chowders at home. This one here is my newest edition to the chowder chapter: a cheesy cauliflower cheddar soup. A plain and simple creamy cauliflower soup with grated cheddar cheese. The perfect bowl of hot and comfy soup for lunch on chilly days. This time I didn’t add any flour because I kind of hoped that the grated cheddar cheese would make the soup thicken enough. And I was right! Because it’s only the hubs and me here at home one cauliflower head easily makes it into 2 to 3 recipes. So quite often I’m in need for great cauliflower ideas. This time the first part ended up being roasted in the oven. Next in line is this soup. After that I guess I’ll be making an aloo gobi, an Indian cauliflower curry. Or a Thai stir fry with cauliflower and fish sauce. I’ll see what comes out of it the moment itself. 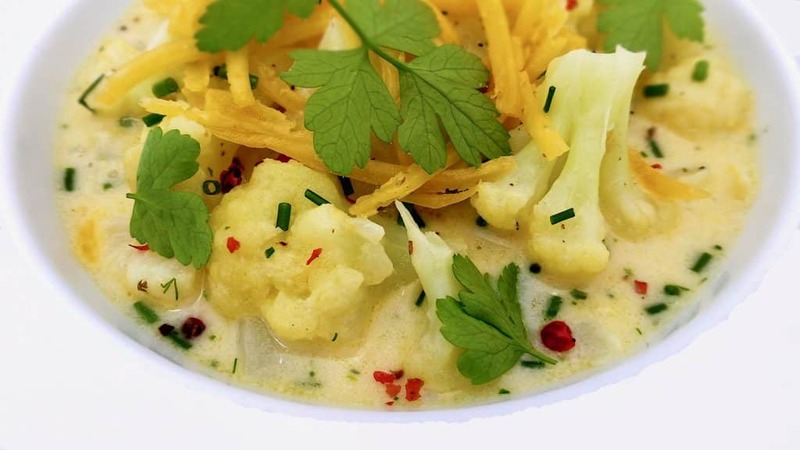 In the meantime enjoy this cheesy cauliflower cheddar soup! Peel the onion and garlic. Chop them all up finely. Add the butter to a large saucepan and place it over medium-high heat until melted. Then add the chopped garlic and onion. Stir and gently cook the onion and garlic for about 5 minutes until it starts to soften a little. In the meantime cut the cauliflower up into small bite-size florets and then add them to the onion in the pan also. Stir well. Bake the cauliflower and onion for 3 minutes. Then pour in the warm vegetable stock and the cream. Season with a good pinch of pepper and salt. Stir and bring the cauliflower soup to a light boil. Then turn the heat lower, cover the pan and simmer the soup for about 7 to 10 minutes until the cauliflower is nearly tender. Then sprinkle with the grated cheddar cheese. Stir the soup well and simmer for another 3 minutes until the cheese has melted entirely and the soup has thickened a little. Then add the freshly chopped dill (or chives). Stir and check the seasoning. Add extra pepper or salt to taste if necessary. I sometimes stir in extra butter or cream to make the soup even more creamier. Then take the pan off the heat and pour the soup into large bowls. Sprinkle with extra grated cheddar. Serve piping hot. I bought this bunch of fresh chervil at my farmer’s market because I wanted to make a classic white asparagus and chervil soup. So that’s how this ham soup was born afterwards. I needed just half of the chervil for my soup. What to do with the rest? Even after adding some to a salad I still had way too much of this fresh and flavorful herb left to just throw it away like that. I collected some leftovers from my fridge and pantry and then started cooking, not knowing where it would lead me. But it all came together beautifully in the end. Here was this creamy potato and cooked ham soup! 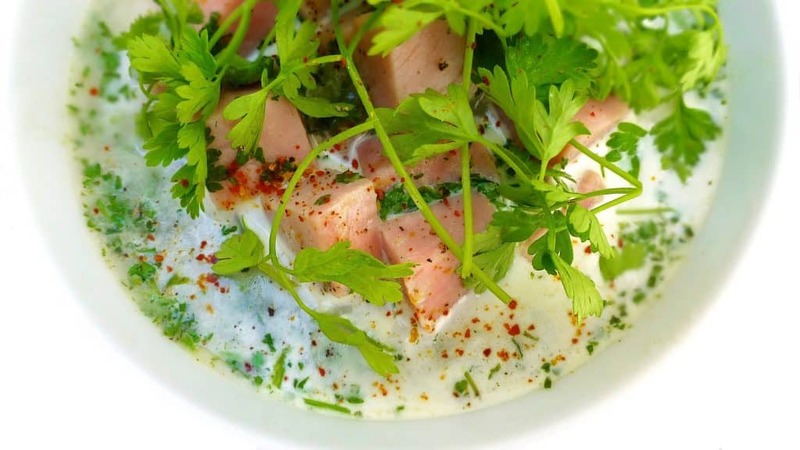 The beer and fresh rosemary flavor go well with the cream and peppery freshness of the chervil. Make the soup as thick as you like. You can also add some flour or add boiled potatoes if you like. Add the unsalted butter to a large saucepan and place it over medium heat until melted. Then add the chopped onion and garlic, bay leaves and rosemary. Stir well. Cook the onion and garlic for 3 minutes. Then add the diced potato. Stir again. Cook the potato for about 4 minutes. Then add the chicken stock and beer. Season with pepper and salt. Cover the pan and cook the ingredients over medium heat for about 10 minutes. Then take the pan off the heat, remove the rosemary and bay leaves and blend or mix it into a fine soup. Add the cream, cooked ham and grated cheese. Place the soup back over medium heat until boiling and cook it for another 5 minutes. Then check the seasoning and add extra pepper or salt to taste if necessary. Stir in the chopped chervil. Then take the soup off the heat again and scoop it onto large bowls. Serve hot.